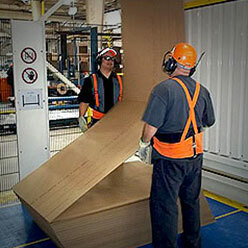 Standard Fold = 60 ½ inches variable 48"-72"
Fanfold ships in bales on a pallet. There are, normally, 2 bales per pallet if the width is 25" or less, 1 bale per pallet if the width is greater than 25"
Standard Lineal Feet per Bale (Singlewall) - 1210 Lin. Ft.
Standard Lineal Feet per Bale (Doublewall) - 605 Lin. Ft.